In the pre-digital days, marketers could target consumers based on what magazines they read or radio stations they listened to—but today, the opportunities for targeting your prospects are far more sophisticated. Thanks to the Web and advancements made in the marketing technology arena, marketers can target ads like never before, customizing their messages to reach very specific niches— for instance, a campaign aimed solely at CTOs at midsized technology companies in the Midwest. This level of precisely targeted advertising gives you the capacity to develop more compelling and highly relevant creative, which enhances your chances of gaining a conversion. Customize your ad copy and images based on each prospect type: For instance, an ad aimed at a CFO might focus on saving money with your solution, while one aimed at a CTO could spotlight your company’s innovative technology. Create a range of offers for every stage of the marketing funnel. Your ad’s impact will vary based on how familiar a prospect is with your company. Design a high-impact banner campaign to boost awareness among new prospects; mid-funnel prospects will more likely respond to white papers and other content offers. 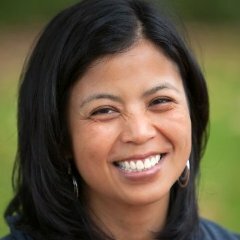 For prospects who have visited your site multiple times, showing an ad for a free demo or trial could help you close the deal. Optimize your campaign with A/B testing. When developing your copy and images for each ad, create several variations for each prospect segment, and run small campaigns with each version simultaneously. After delivering several thousand impressions, you’ll be able to tell which ad variant is achieving the highest conversion rate. You can then optimize the campaign by displaying only your highest-performing variant to each audience segment. Small changes can make a big difference: SAP found that ads with images delivered a 62% lift over those without. 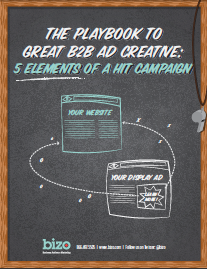 For more tips on developing a killer ad campaign to reach your ideal prospects, download our Playbook to Great B2B Ad Creative.